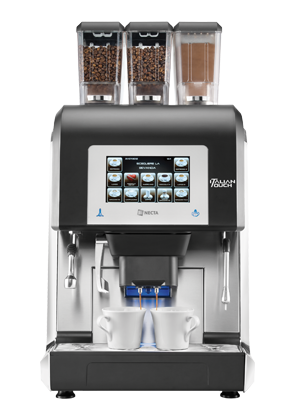 The MARS DRINKS™ FLAVIA® Creation 500 blends stylish design with enhanced drinks and menu display options making it easier than ever to create and enjoy the perfect brew. Enhanced LCD menu display for a more intuitive brewing experience. Portable and flexible, with jug fill and plumbed-in options for easy office placement. provide high quality drinks, satisfied customers and increased profits. This represents one of Krea’s many features, together with the fact that the coffee hopper and waste container’s capacity are perfectly balanced, to guarantee the highest level of operational efficiency. 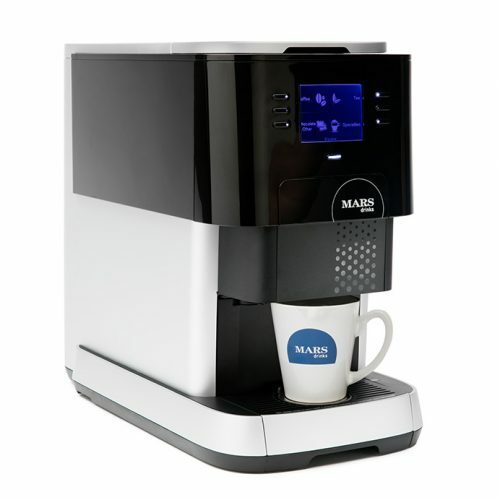 Designed for day to day coffee service in high quality hotels and especially for breakfast coffee, Karisma represents outstanding dispense speed and high productivity (up to 200 cups per hour). Karisma offers a wide customizable range of hot drinks based on authentic Italian espresso coffee beans and fresh milk, or soluble products such as chocolate. The new super automatic Karisma is characterised by a contemporary and elegant Italian design, compact dimensions, stylish accessories and eye catching touch screen interface. Karisma, the Italian touch. 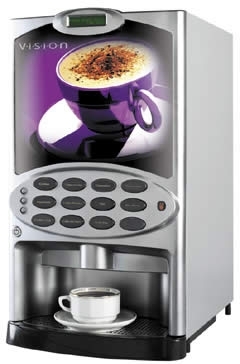 Quality drinks from a machine with great capacities and useful features in an easy to use and proud yet stylish design. The Nio from de Jong DUKE confirms what you expect; a surprising coffee experience from a professional and distinguished looking machine. A very useful feature of the Nio is that it can be completely operated without having to open the machine. Filling, cleaning and the removal of used grounds can be done from the outside of the machine. This keyless cleaning & operation also dubbed as closed door cleaning will make cleaning an easy task while keeping your hands clean. The ingeniously placed functional LED lights not only allows you to tune the machine to its environment but also assists in the operation of the machine. A misplaced canister or a full waste bucket will be shown with subtle visual indicators. The visible ingredients not only adds to the experience when enjoying your drink but also allow for easy filling. 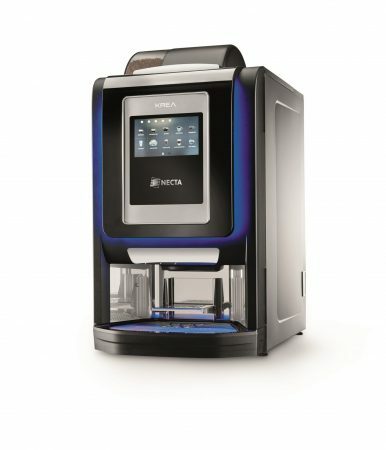 With a possible daily throughput of 150 plus drinks the Nio is positioning itself to be useful in both office locations as well as in more catering and foodservice related sites. 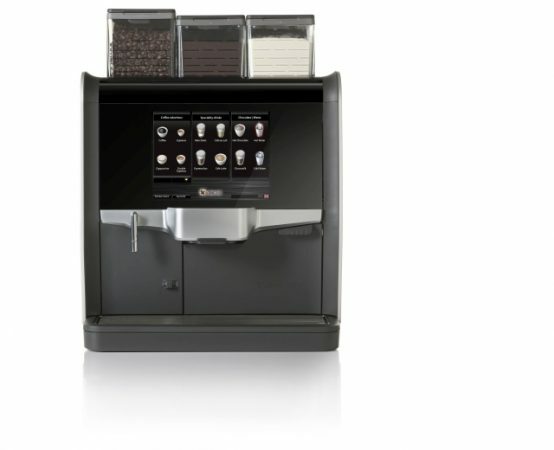 Options like a waste guide, drain connection and automatic cleaning make the machine ideal for any mid size volume location where a high quality beverage should be combined with an easy and hassle free operation. 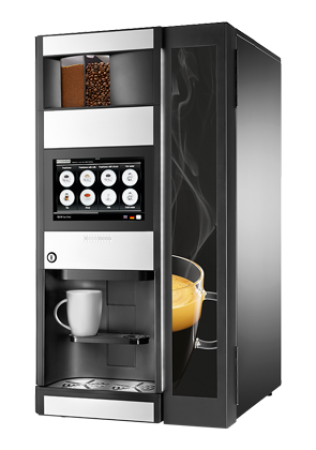 As of fall 2015, Wittenborg adds a new touch to hot beverage vending: The launch of the Wittenborg 9100 range features a user-friendly touch screen technology to set new standards. 9100 is the new generation of Wittenborg vending machines, a further leap forward in design and technology from the success of the previous 7100 series. It offers a wide specter of selections and choices made easy by the intuitive interface of the 10” HD screen, visually guiding the user. 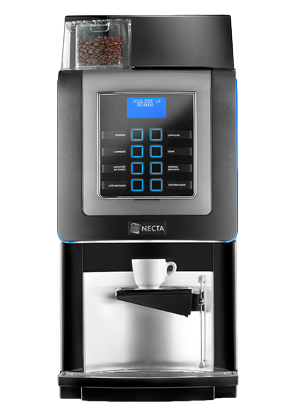 The Necta KREA Touch is a stunning new Bean to Cup Coffee Machine to add to the already impressive Necta range. With an elegant new design to compliment the high quality internal components, the Krea Touch is the ideal Coffee Machine for Offices, Hotels, Meeting Areas & Takeaway locations where it is essential to produce Barista quality Coffee at the touch of a button. Featuring a new 7 inch touch screen, this allows users to easily navigate through the Menu or simply select the preferred speciality from an endless selection of Drink options. A 1.2kg Hopper is combined with 3 further canisters for Decaff Coffee, Milk & Hot Chocolate to ensure the freshest Cup of Coffee or Chocolate can be prepared in seconds. 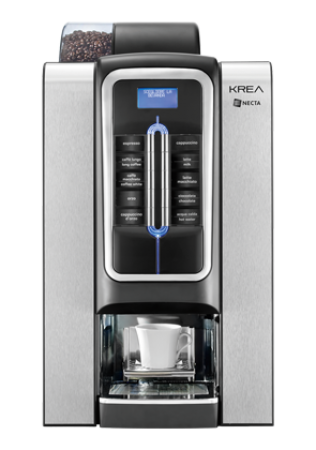 With the robust patented Brew Unit, the Krea Touch is versatile and can be programmed for and array cup sizes such as 7oz, 9oz or 12oz. A direct Water connection and user-friendly Cleaning Cycles guarantee the Krea Touch daily maintenance is quick and simple.